Do you ever stop and ask yourself whether building a community around your brand and your message is a necessary step to growing your online business? Do you ever hesitate or procrastinate over investing money in yourself and your business? 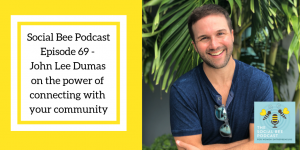 Then you’re going to love this week’s interview with the one and only John Lee Dumas of Entrepreneurs on Fire. I had the great pleasure and honour of meeting John in person in Dublin, and as a direct result of that connection, here I am, sharing this fab interview with you. Tune in to listen to John talk about the importance of building a community, directly interacting with your audience, and investing in yourself and your business. Why you should make the time to connect with people in your audience on an individual basis. The one thing you can do find out what people’s biggest pain points really are. Why investing in yourself can not only fast-track your success but make it possible in the first place! Plus, as an added bonus, you’ll find out what you have to do to get a personalised voice message from John! John’s podcast – Entrepreneurs on Fire. John’s membership – Podcasters’ Paradise. The Freedom Journal vs The Mastery Journal. John Lee Dumas on Facebook, Instagram, and Twitter. Such a blast getting to chat on your show after hanging out in Dublin! You ROCK! hey John, loved meeting you and Kate in Dublin and you were a star on the podcast – thanks for coming on and sharing such great advice! #ignite!